I make and repair guitars and other stringed instruments. I am based in London. “The guitars arrived at lunchtime thanks all safe & sound, and thrilled with the Guild!!! 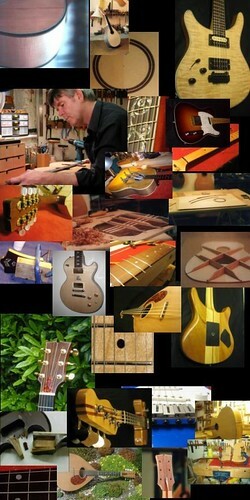 Welcome to my website, a window on my workshop, a thriving industry of guitar repairs and customer commissions. You can also meet me and take a virtual tour (updating, back soon) of the workshop described by visiting guitarists as an Aladdin’s Cave of guitar player’s delights. On this site you will also be able to view a variety of commissioned Acoustic, Electric and Bass guitars as well as a variety of Mandolins and Mandolas. For help, advice, information and handy tips visit my Tech Tips pages. Simply navigate from the left hand side of the page. Your visit to this site is valued and much appreciated so please feel free to leave feedback or comment where appropriate. I will do my best to respond as soon as is practical. The site is perpetually upgraded and developed with useful information to benefit the guitarist. Visit my blog pages for interesting repair case studies, or better still click on the RSS button for automatic updates.